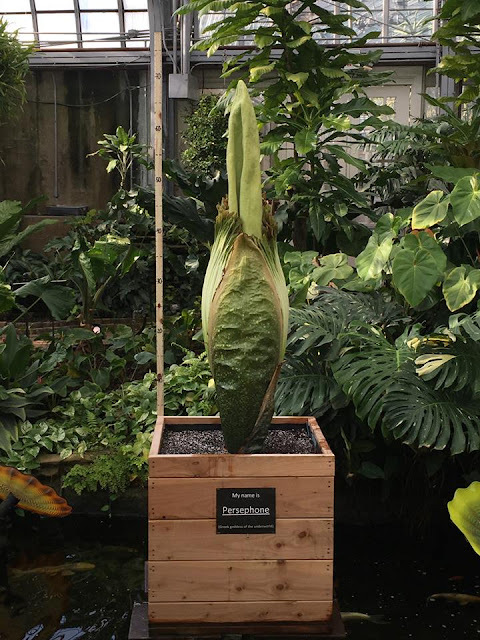 GARFIELD PARK CONSERVATORY’S RARE CORPSE FLOWER IS BLOOMING! ChiIL Mama's waiting with baited breath for Garfield Park Conservatory's #‎CorpseFlower to open it's stinkin' bloom. We missed both the Chicago Botanic Garden's recent corpse flower flop and success. Chicago will have a new rep as smelly corpse flower land instead of smelly onion swamp at this rate. Hope to see this one! Follow along at #‎GPCPersephone! Persephone's bloom cycle has begun, a rare event that can take a decade and reek like rotting flesh! 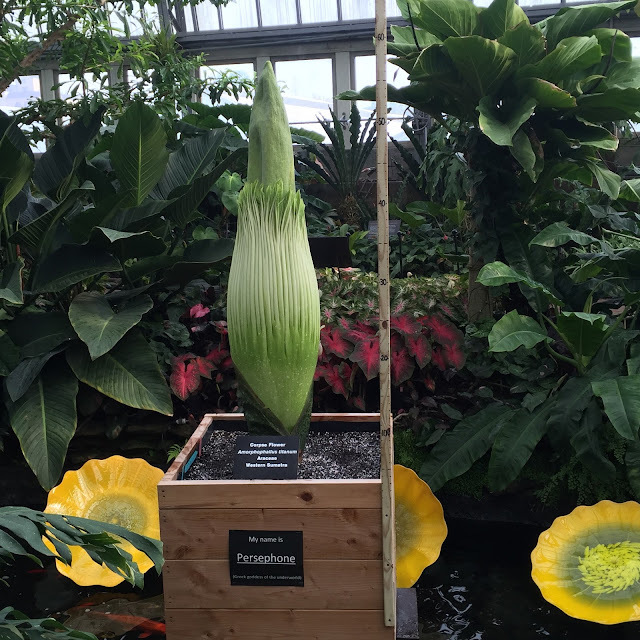 The Chicago Botanic Garden donated the titan arum, also known as the corpse flower, to the Garfield Park Conservatory on May 31, 2016, and it is finally ready to bloom! Don’t miss this rare opportunity to see (and smell) one of the largest and rarest flowering plants in the world. The exact time of its flowering is hard to predict and happens very rapidly after the blooming process begins. When the corpse flower does bloom, it is usually open for ONLY 24 to 36 hours. The staff predicts that Chicago's current warm and humid weather will hasten the plant’s opening. The Garfield Park Conservatory staff is excitedly tracking a rare spectacle unfolding in its own backyard. Meet Persephone, the titan arum (Amorphophallus titanum), also known as the corpse flower. For a titan arum to germinate from a seed to a corm that can send up a leaf and then bloom, it can take more than a decade. Once the unique plant opens, it will release a distinctive bad odor, which some describe as being similar to that of rotting flesh and smelly feet. Since the odor is strongest in the early hours of the morning, the Garfield Park Conservatory (300 N. Central Park Ave) will be open to visitors until 12 a.m. (last admission will be at 11:30 p.m.) the day Persephone blooms, and re-open at 6 a.m. the following day. Normal hours are from 9 a.m. – 5 p.m., Monday thru Sunday, with extended hours from 5 p.m. to 8 p.m. on Wednesdays. Admission to the Garfield Park Conservatory and parking is free. It is also accessible via the Green Line – Conservatory stop. For updates follow the conservatory on Facebook and Twitter hashtag #‎GPCPersephone‬, or call the Garfield Park Conservatory at 312-746-5100.